The Florida Farm Bureau Federation is providing $2,000 in scholarships for women in agriculture to attend the Women’s Leadership Conference, April 5-7, 2018 in Tampa. Eight $250 scholarships will be awarded to individuals to attend the conference. The priority of awards will be given to first-time attendees of the conference and women who also serve on their county Farm Bureau Young Farmers and Ranchers Committees. 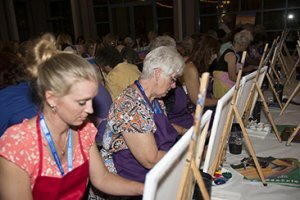 Themed “The Treasure of Florida Agriculture,” the Women’s Leadership Conference will be held at The Westshore Grand, A Tribute Hotel in Tampa. The three-day conference registration fee is a nominal $100 per attendee, plus lodging. To apply for a scholarship, visit https://floridafarmbureau.formstack.com/forms/wlcs18. The scholarship application deadline is Feb. 28. For additional information, contact your local County Farm Bureau or visit https://www.floridafarmbureau.org/programs/farm-bureau-women/.